Maidbot’s flagship product is named Rosie, a cleaning robot. Rosie is – you guessed it – named after Rosie, the robot maid on The Jetsons, and she’s bringing a new level of efficiency to hotel cleaning. 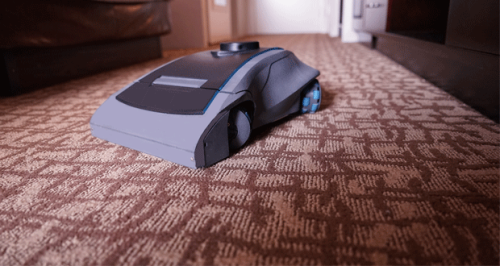 Rosie was created to assist a hotel’s housekeeping staff by cleaning floors while the human housekeepers performed other duties, cutting the time spent cleaning each room by 15-20 percent and decreasing rates of worker injury. So far, Maidbot has raised $2 million in Series A funding, and Micah says they have been in talks with Marriott, Hilton, and Wyndham to have them start using a fleet of Rosies. Micah was inspired to bring Rosie to life after working as a housekeeper in a hotel operations class he took as a student at Cornell’s School of Hotel Administration. That’s where his Quarter Zero training really helped him. “Because QØ had taught me to focus on really understanding the problem, I started bringing around a notepad, interviewing people, figuring out [what were] the toughest parts of the jobs for them,” Micah says. He used a stopwatch to time each of his room-cleaning tasks and researched all the costs. What’s more, Micah says, he discovered that the housekeeper role in particular, has the highest variable costs and inconsistencies – and incredible injury rates. Some of the “dull, dirty, and dangerous” work carried out by housekeepers, says Micah, would be the perfect job for a robot. He also learned that major hotel brands had tried Roombas and other consumer robot vacuums, but none of them were designed for industrial work. Their power sources would fail after just a few weeks of continuous use. “But it’s more than just a vacuum,” Micah says. He’s quick to clarify that Rosie is a “mobile computer in every room, an indoor data platform.” Rosie the Maidbot robot gathers data as it cleans, which can help hotels learn which areas tend to get the dirtiest, or where in the room guests are spending most of their time. It can also track volatile chemicals or let administrators know where there is a potential for mold. Maidbot has captured so much of his passion, in fact, that Micah chose to drop out of Cornell in order to focus his attention full time on Maidbot. Though Maidbot has found lots of interest so far, landing Micah and Maidbot on the cover of Lodging magazine, featured in Forbes, and on Inc.’s list of the Top 30 Emerging Companies, Micah knows that not all business ideas were destined to be a winner. At the QØ Catapult Incubator, Micah joined a team called School Scoop, which was building technology that let students know what was going on at their school. It gave him his first taste of implementing a real-world solution. “We actually licensed the software to school districts around the US,” he says. In addition, says Micah, his QØ advisors and mentors were a huge part of getting him hooked on entrepreneurship. He enjoyed delving deep into different case studies with them, and he credits the entire QØ experience with giving him the skills and the confidence to build his own company. His advice to other high school entrepreneurs or QØ alumni trying to start a business? And if there are are a lot of different ideas competing for your attention, Micah suggests pinpointing what you makes you get up in the morning, and focus on that.